Artificial Olfaction is the science of gas sensing with artificial sensor systems. We study in particular open sampling systems where the gas sensors are directly exposed to the environment. Open sampling systems are opposed to common laboratory setups, which use sophisticated sampling systems to keep parameters such as air flow, temperature, humidity and concentration of the chemical compound constant over a prolonged time. For most real-world applications this is not possible. We address the corresponding challenges and aim to further develop systems known as “electronic nose” (e-nose) towards a “mobile nose” (m-nose). 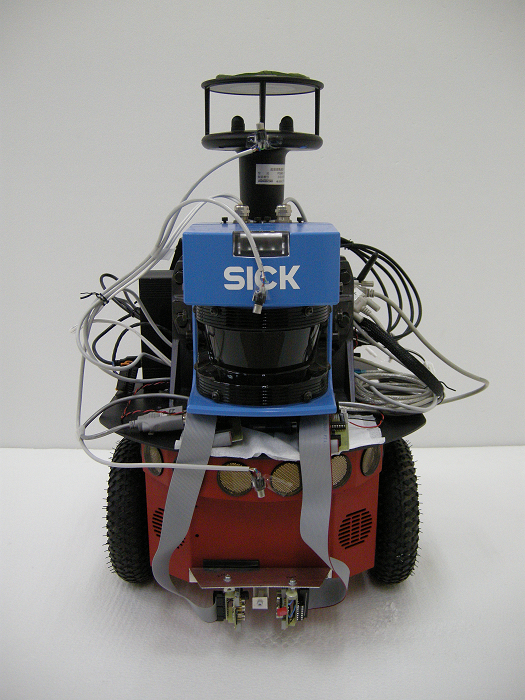 By combining artificial olfaction and mobile robotics we study the foundations for Mobile Robot Olfaction. Application domains of interest include gas sensor networks and mobile robots for surveillance of landfill sites, monitoring of air pollution and gas leak detection and localization. 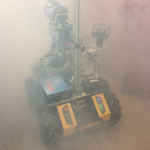 We explore the use of emerging gas sensing technologies in combination with mobile robots. One of these emerging technologies is remote gas sensing. 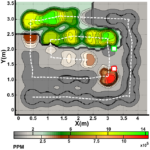 Remote sensors report spatially unresolved integral concentration measurements. This means that the sensor itself does not provide any information regarding the path followed by the emitted beam or the gas distribution along the optical path. At the MRO Lab, we introduced the concept of Robot Assisted Gas Tomography (RAGT). RAGT uses mobile robots and remote gas sensors to estimate the spatial distribution of gas concentrations. RAGT is inspired by Computer Assisted Tomography (CAT) where the image of a static object is reconstructed from a set of attenuation measurements. In RAGT however, the phenomenon of interest (i.e. gas dispersion) is highly dynamic. The tomographic reconstruction of the concentration field is then carried out using the acquired concentration measurements and the optical paths as inputs. RAGT offers a flexible measurement system, compared with traditional measurement approaches. This can bring several advantages to the tomographic reconstruction process. For example, large areas can be covered using a single sensor by moving the robot to different measurement positions and adaptive measurement geometries can be realised according to the conditions sensed in the area of interest. RAGT requires the the fusion of different mobile robotics disciplines such as 3D perception and localization since, in order to perform tomographic reconstruction, information about the geometry of the environment and the robot’s pose is critical. 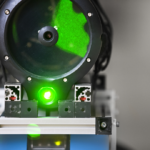 Of particular importance is the estimation of the optical paths traveled by the sensor’s beam. During its development process, Gasbot received several accolades such as the KUKA Service Robotics Best Paper Award (2013/05/09. The conference article “Towards Real-World Gas Distribution Mapping and Leak Localization Using a Mobile Robot with 3D and Remote Gas Sensing Capabilities”, that describes the GASBOT system, won the “Best Service Robotics Paper Award”” at ICRA 2013, the largest and arguably the most prestigious conference in robotics. The award promotes cooperation between robotics science research and industry R&D advancement in the area of service robotics applications (both professional and domestic). It was the first time that researchers at Örebro University won the award. In addition, Gasbot received the Award of Distinction for Environmental Contributions (2012/10/02) from Clearpath Robotics. Clearpath offered a state-of-the art Husky A200 robotic platform to research teams from all over the world through its PartnerBot Grant Program . More than 150 universities submitted proposals for the grant and Gasbot was selected as one of the 10 recipients. 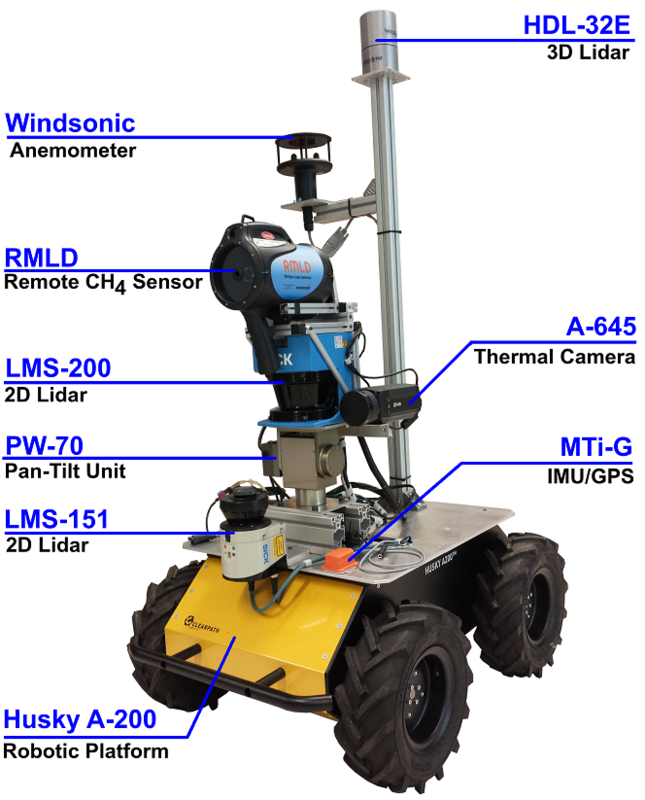 Sensor planning in gas emission monitoring applications with mobile robots is important due to the on-board battery power that provides limited duration of monitoring activities, and sensor constraints such as sensing range and field of view. At the MRO lab, we investigate sensor planning algorithms that compute efficient exploration plans that consists of sensing positions to collect measurements and traveling path between them is desired to monitor large environments. These algorithms address the problems of gas leak detection, and after potential gas sources have been detected, the exact location and magnitude of the leakage is investigated with a second exploration trajectory for the task of RAGT. Gas discrimination can be carried out with laboratory or hand-held equipment based on spectroscopy, optics and analytical chemistry. However, these devices are expensive and often, their bulky size prevents them to be used in field inspections. 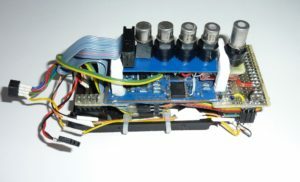 In addition, most of the currently available gas sensing technologies suffer from a number of shortcomings like lack of selectivity (the sensor responds to more than one chemical compound), slow response, drift in the response, and cross-sensitivity to physical variables like temperature and humidity. At the MRO lab, we explore the use of electronic noses, which are arrays of partially selective gas sensors and pattern recognition algorithms, for the task of gas discrimination in open, uncontrolled environments. The capability of predicting the identity of acquired gas measurements is of high importance when designing MRO systems. The presence of multiple chemical compounds is expected in most target application scenarios and therefore, MRO systems should be able to discriminate, for example, target compounds from interferent substances. This work investigates how a truthful spatial representation of a gas distribution can be derived from a sequence of gas sensor measurements and other relevant modalities such as wind measurements. These measurements may be recorded with a single robot or with a group of robots together with a network of sensors. The particular difficulties that have to be addressed are the temporally fluctuating character of gas transport in natural environments due to turbulence, the small area chemical gas sensors provide information about, the presence of multiple chemical compounds and typically also the slow response and recovery time of gas sensors. Given these properties of gas distribution and the sensing process, we cannot map the instantaneous gas distribution at each instant in time but rather aim at representing the time-constant structure of a gas distribution. We have conducted several experimental runs in a wide range of environments, from tightly controlled indoor environments to real-world, industrial settings. This work investigates gas source tracking (also called gas source tracing), i.e. the process of following cues determined from sensed airborne chemicals (and eventually using other sensor modalities) towards a gas source. Gas source tracking is an intricate task under natural conditions due to the turbulent nature of gas transport. The gas distribution is patchy and quickly fluctuating and hence the concentration field does not guide the way to its source by means of a smooth concentration gradient. 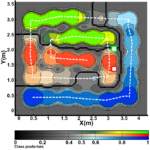 Nevertheless, some animals show remarkable gas source tracking skills. 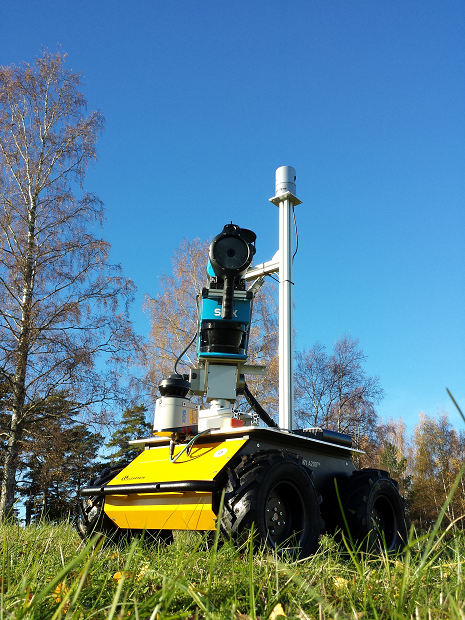 We study gas source tracking with mobile robots equipped with gas and wind sensors, particulary aiming at outdoor operation. In this work we explicitly address gas source declaration as a sub-task of the general gas source localisation problem. Gas source declaration is the process of determining the certainty that a source is in the immediate vicinity. Due to the turbulent character of gas transport in a natural environment it is typically not sufficient to search for instantaneous concentration maxima in order to solve this task. Our experiments with gas-sensitive mobile robots in a real-world environment demonstrated that learned classifiers can be used for gas source declaration based on a time series of concentration measurements. These initial results showed that the fine structure of the concentration profile in the vicinity of a gas source contains information about the distance to a gas source, and that this information can be extracted as statistical properties of an unknown or only partially known system from a number of training examples. The description included in the extracted classifiers is, however, not intuitive and cannot be translated into a human-understandable form. The particular focus for future work will be to investigate how an analytic description of the knowledge can be extracted from the learned classifiers. There is, however, currently no funding to pursue this research direction.